Can you feel it? Cool mountain air, smooth wood railings and an overwhelming sense of adventure. Elk Ridge Estates is home to some of the finest cabins in the Duck Creek area, without a doubt this cabin is among those ranks. Beautiful construction from top to bottom. 3 level cabin sits on 2.13 acres among a thick forest of oak and cedar. Main level encompasses high vaulted ceiling, dining area, spacious kitchen with bar seating and a eastward facing windowed wall with breathtaking views of emerald pink cliffs. The upper level deluxe master was built for comfort and privacy. Attached master bath features dual sinks, jetted tub and walk-in shower. No mud, no worries! The subdivisions paved roads will lead you here, a huge graveled yard. Detached two car garage provides convenient space to protect your cars and recreational vehicles from Southern Utah's four seasons. 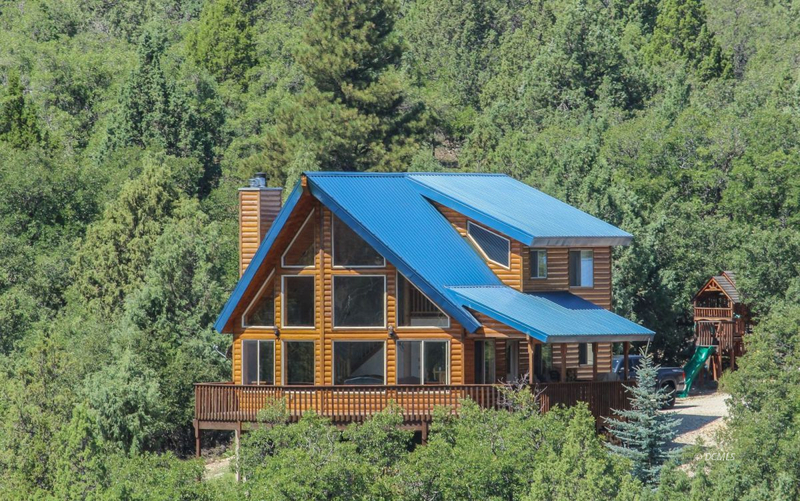 Enjoy the Wrap around covered/uncovered deck where a variety of Utah's wildlife can be spotted. Lower level features an additional living/recreation room, 2 beds and a full bath. Home is plumbed for A/C. Experience your mountain adventures from this fine cabin.